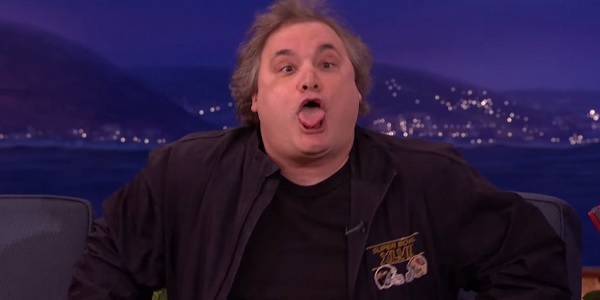 If there were a list of the 7 billion classiest people in the world, comedian Artie Lange would be an alternate for number 7,000,000,000, but it’s his gloriously cruddy schtick that makes his fans love him so much. And that persona doesn’t just go away when he walks off the stage, either. Obviously, we’ve all been wondering about what one of the weirdest lies he’s ever told a woman was in order to help his chances, and now we know that it had a little something to do with killer dinosaurs. Appearing on Conan, his home away from home, Lange shared the following story. Everyone lies. It’s a human thing. You wanna try to get laid. You lie. I’ll tell you what. This is the god’s honest truth. I was in a club in L.A. about 16 years ago. I made out with a chick who I told I wrote Jurassic Park. Bam. Done. Just take it all down, because it’s not going to get any more ridiculous than that. I can’t imagine the amount of intoxicants that would have to be in my body in order to even think about using that as a line. (Not that I’ve ever done that kind of thing anyway.) He didn’t even go with a romantic comedy or something that would have worked in the moment, but Jurassic Park, one of the biggest blockbusters of all time. To his credit, this was before people could just instantly pop a smartphone out to prove or disprove anything. And though I vaguely recall what novelist and co-screenwriter Michael Crichton looked like, I have absolutely no idea what his fellow writer David Koepp looks like. And I just saw his face on IMDb a little while ago. In any case, I don’t think that this is the face of a man who created anything more theatrically substantial than Beer League. After that story, co-host Andy Richter brings up a memory about Lange getting laid by saying he was Andy Richter, who was married at the time (and still is). Here’s how that went. I was doing stand-up in Chicago. I was at a Cubs game at Wrigley Field. There were these ossified drunk, smoking hot chicks in back of me who thought I was Andy Richter. Cause they had seen me on [Late Night with Conan O’Brien] and they put two and two together. A couple of fat guys…And you know, I made out. I went back to the chick’s apartment. And I was rolling around on a couch with her. I got a little further than I can go here on TV. Of course, he then said that he fucked her. That’s the Lange way, dammit! You can check out the whole clip below, which kicks off some Brian Williams talk. Find Conan on TBS every weeknight, and find Artie Lange at comedy clubs all over the country or listen to his The Artie Quitter Podcast.